I don’t care about Valentine’s Day. Now, I’m admittedly bad at holidays and birthdays. I wasn’t raised with such celebrations being treated as something special or magic, but rather an obligation, if observed at all. We didn’t celebrate Halloween or the pagan bit of Easter, so none of the fun stuff. I’ve worked hard to feel Christmas spirit over the last few years with mixed results. Typically, I start to feel it closer in to the day then I observe most people starting to get jolly and begin to listen to Christmas music. I accept I might never feel about Christmas how someone like my best friend Kate who adores and obsesses over Christmas, but I manage to become a bit less Scrooge-like each year if only to avoid being the person who dampens everyone else’s joy. Same story for the other family orientated holidays. Valentines Day is a little different as it has less to do with family-of-origin and more to do with social standing. The way I see it, February 14th is two distinct holidays. First, comes the elementary school class party. Back when I was in school, cupcakes and other sugary treats were allowed, but the center of the celebration were the valentine cards. Being a dorky, shy kid on top of a military brat, I have some truly depressing memories of getting cards made out to “New Girl” or substantially fewer than than the other kids. Nothing is worse when you’re new to a classroom than free time to watch the kids who’ve bonded since September hanging out, loudly socializing. In middle school and beyond, Valentines is all about couples. Of course, as a thirty-one year old, I can see “dating” before one is old enough to drive or otherwise go on an unchaperoned date is totally pointless. I didn’t sweat it too much at the time either way. For one thing, I still wrote back and forth with my childhood sweetheart until I was around fifteen. For those counting, that makes for a five year long distance relationship. Weird, like most of my life story. In high school, I was jealous of the girls getting balloons and flowers from their boyfriends. Yet it seemed so much showing off and distraction even to my teenaged self. Through mutual decision, Chris and I have elected not to celebrate Valentine’s Day. I don’t find it’s celebration meaningful. He refers to it as Satan’s birthday. It is our second February together, a milestone more notable for signing a second year lease on our apartment, then by an arbitrary date to which holds no meaning for either of us. What I don’t understand is the viciousness which some people hate Valentines Day. Sure, our culture is a bit annoying if you’re single (or in any other way non-standard), but you don’t have to play into it. If you’re unhappy being single, work towards not being single. Obviously, I’m not saying to jump into a relationship with someone unsuitable, but putting yourself out there, making friends and becoming the person you want to be is far more productive than sitting around bitching about other people celebrating with some overpriced roses and sappy sentiments. Why do they have the power to make you feel bad? Instead, just plan to go buy chocolate at a steep discount on February fifteenth and, of course, enjoy the cultural mash-ups the internet gives us. The cool card above came from a mutual-geek-franchise set on Ho w to Geek. 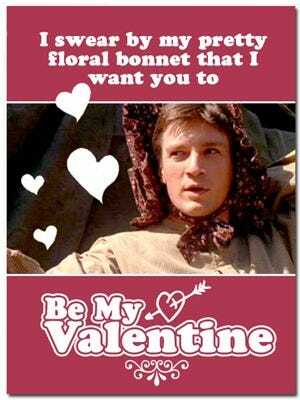 If you’re going to send Valentines, might as well feature Nathan Fillion in a bonnet.